I was very impressed when I reviewed NI’s Strummed Acoustic back in the January 2016 issue of SOS, and speculated that NI were likely to have plans for other ‘themed’ guitar VIs based on the underlying engine. This has proved to be the case as Strummed Acoustic 2 appeared soon afterwards offering both further six-string and 12-string options. The subject of this review is Electric Sunburst and, as the title suggests, this time around we are dealing with a Les Paul-style electric guitar. 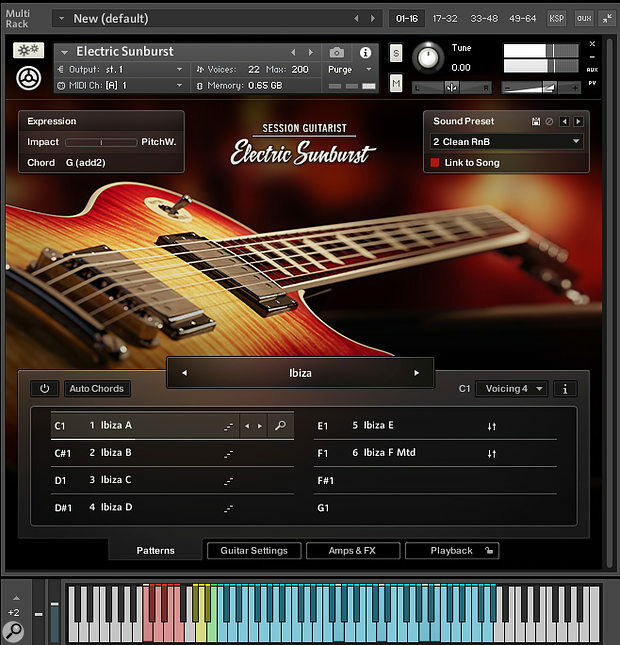 The underlying concept remains the same though; Electric Sunburst delivers highly polished electric guitar performances via a Kontakt front-end that shares some principles with Steinberg’s long-discontinued Virtual Guitarist instruments. Feel free to refer back to the original Strummed Acoustic review for the details but, in essence, the instrument offers a generous selection of style-based performance patterns but with the flexibility to play these at almost any tempo and to voice them with a range of different chord types. It really is ridiculously easy to create mix-ready guitar parts. Guitar aside, what’s perhaps different for Electric Sunburst is that those patterns included picked patterns and riffs as well as strummed performances. In addition, you also get some simple — but very effective — amp and stompbox modelling options so you can dial in crystal cleans, hi-gain overdrives or pretty much anything in between. Both of these additions are great to see; add in the various performance controls, the very neat chord ‘voicing’ option (great for adding extra harmonic flavour to your chord selection) and the doubling switch and the engine really does allow the user to coax plenty of mileage from the range of included patterns. In terms of styles, the patterns cover a lot of ground from simple campfire-type strumming, mellow picking, reggae rhythms, Latin and plenty of flavours of rock. Most are in 4/4, but there is a smattering of 3/4 and triplet pattern groups and the Swing control allows you to spice things up further. No, it is not an endless array of performance patterns, and you can’t create your own but, if you fully exploit all the performance options, it will be some time before you exhaust the possibilities. As with Strummed Acoustic, the UI makes all this incredibly easy to use. It will, therefore, appeal to exactly the same type of user as the original release. Busy media composers needing fast results will love it, as will those without guitar skills needing some guitar parts. However, I suspect even a few guitar players will also find themselves happy to sneak in an Electric Sunburst track or two where the musical mood suits simply because the end results are so polished. It’s not as powerful as, for example, Vir2’s excellent Electri6ity, but it’s easier to master. And, at this price, excellent value for money.